Do You Have a Dismal Perspective? Back in August I signed up to do my first 10k race. It seemed like a good idea at the time, what with a really fun Hood to Coast under my runner’s belt. The fact that I signed up for The Great Columbia Crossing on a day when the sun was shining and my thermometer read 89 degrees most likely influenced my decision to run a race that starts at a place named “Dismal Nitch.” Amazing how perspective makes all the difference in just about everything. 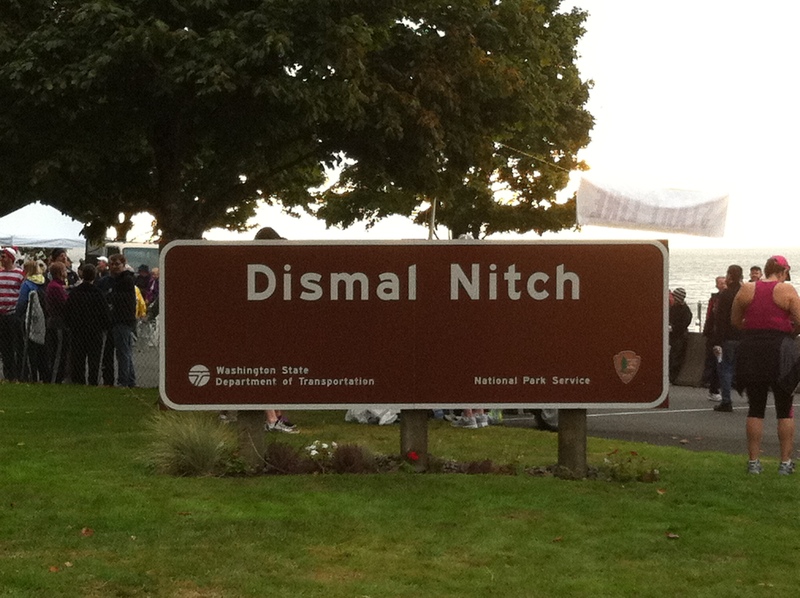 If you are a bit of a history buff, you’ll know that Dismal Nitch gets its name from poor Meriwether Lewis and William Clark, who spent time huddled against it during a winter storm at the end of their passage down the Columbia river. Standing there this morning, as the sun attempted to break through the clouds and get its glory on, it didn’t look terribly dismal to me. But being a native to these parts, I can image just how dismal a nitch it must have been for those men and their crews as the winter storm beat against them. As I ran across the Astoria Bridge, I turned back just as I started the big climb and the shore a few miles behind me looked far from dismal. The clouds and mist had rolled back in and the river was a steely gray color a few shades darker than the sky. All that diffused lighting made the far shore seem to shimmer a bit. It looked lovely and not dismal in the least. Perspective makes such a difference. Take that run, for example. Running up that bridge was a bit challenging. But running down the other side? Super fun. Amazing how a change in effort changes one’s perspective. As we drove home, my friend pointed out a hawk sitting in a tree alongside the road. “I love hawks. I see them all the time. Of course, I do look for them,” he told me. “I think hawks are pretty amazing, too. Isn’t it funny how what we see is usually what we are looking for?” I responded. I have had a few opportunities in my life to reframe my view on a person, event, situation, et cetera. And each time I am amazed at what I see when I’m looking for it. Look for the good in someone? You’ll find it. Look for proof they are “bad” or whatever, and that is what you will see. Perhaps we could all use better vision. ps. I included the above picture not only because it is the park sign for Dismal Nitch. It also includes it’s own “where’s Waldo” moment. Enjoy! This entry was posted in Front Page and tagged Columbia River, Columbia River Crossing, Dismal Nitch, Lewis and Clark, perspective, running by kristina. Bookmark the permalink. You’re right, of course. We do tend to see what we’re looking for. If you’re looking for offense in every comment from another person, you’ll find it easily enough. Give people the benefit of the doubt, and you’ll be surprised at the good you can find. It’s all about where you choose to focus. So good to see you Linda. You are such a ray of sunshine in my world. 🙂 When I look at you, I see awesome! OMG Waldo really is in Dismal Nitch! This is a name that us authors gotta love because it can’t be said without the imagination kicking into high gear. I agree, reframing is a great skill. It can make all the difference. Thanks for the timely reminder. I must admit, some days I do tend to have a “dismal outlook”. I’ll try to remember to look back across the bridge. Great visuals in that scene, by the way. Thanks for the retweet kind sir! Wow – I loved this post! Beautifully written reminder. Thanks sweetie and thanks for the retweet.